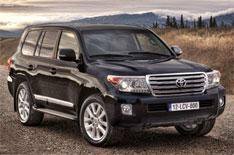 2012 Toyota Land Cruiser V8 launched | What Car? The Toyota Land Cruiser V8 has been given a range of upgrades for 2012, including revisions to its engine, improved looks, and new technology to enhance its off-road capabilities. It has a new front bumper that integrates the foglights and a new grille. The headlight and rear light clusters have been redesigned, as have the door mirrors. The 4.5-litre V8 turbodiesel engine now complies with the latest European emissions legislation and the car's interior has been revamped to raise 'the level of perceived quality', says Toyota. The Land Cruiser V8 is available in one trim level only. Added standard equipment includes a heated steering wheel, heated and cooled front seats and a new multimedia and sat-nav system. Perhaps the biggest changes are new technologies to improve the car's off-road capability. The Land Cruiser V8 now has Turn Assist, which reduces the car's turning circle at low speeds. Crawl Control helps make slow and controlled ascents and descents. Multi-terrain Select automatically changes the throttle, braking and traction control to give the car the best traction over five types of surfaces: Mud and Sand, Loose Rock, Mogul (snow), Rock, and Dirt and Rock. Multi-terrain Monitor comprises four cameras around the car that allows the driver to spot obstacles. The 2012 Toyota Land Cruiser V8 goes on sale on March 1, for 62,285. The current model costs 60,600.